Dieses Werk wird das große Standardwerk über Pflanzen in der Homöopathie werden. Es ist das erste, das nicht nur einzelne Familien, sondern auch die komplette übergeordnete Baumstruktur beschreibt – von den ursprünglichen Algen und Farnen bis zu den hochentwickelten Asterngewächsen. Jan Scholten gibt die Themen der großen Abteilungen wie der Blütenpflanzen, der Klassen und Ordnungen bis zu den einzelnen Familien und den zugehörigen Pflanzen. Diese wiederum teilt er einzelnen Stadien zu und formuliert deren Essenz und gibt kurze Beispielfälle. Allein der Umfang von über 1.800 Einzelmittel-Beschreibungen machen das Werk zu einer Enzyklopädie. Alte Bekannte wie Lycopodium oder Thuja erscheinen in neuem Licht. Jedoch eröffnet sich auch eine Fülle an bisher völlig unbekannten pflanzlichen Mitteln. Der eigentliche Wert liegt jedoch in der Entdeckung der Systematik der Pflanzen. Jede Pflanze wird durch ihre botanische Zuordnung in ihren Eigenarten verständlich, wobei Jan Scholten der neuesten auf genetischen Analysen basierenden APG-Klassifikation folgt. Dadurch zeichnet sich eine völlig neue Materia Medica ab, die nicht nur aus Symptomsammlungen besteht. Die Themen von Familien und Ordnungen machen die Fülle der einzelnen Mittel erst verständlich und ableitbar. Bekannte Heilpflanzen wie Belladonna und Solanum nigrum werden besser verstanden, wenn sie durch die Themen ihrer Familien (Solanaceae), Ordnungen (Solanales) und Klassen (Lamiidae) gesehen werden. So ist erstmals eine Voraussage möglich, wie und bei welchen Krankheitszuständen bisher ungeprüfte Pflanzen verwendbar sind. Damit erweitert das Werk unsere therapeutischen Möglichkeiten in erstaunlichem Maße. Die Theorie der Pflanzen ist inzwischen in der Praxis vielfach bestätigt worden. Hunderte von homöopathischen Fallschilderungen zeigen, wie man sie praktisch anwendet. Der Leser kann dies vor allem durch die sehr erhellenden kurzen Fallanalysen lernen. 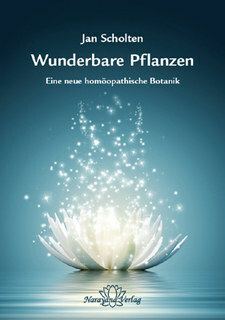 Das Buch ist ein absolutes Muss für jeden Homöopathen, selbst wenn man es nur als Nachschlagewerk benutzt. Das vermittelte Wissen ist fast unermesslich. Man kann nur ahnen, was dieses neue System für die homöopathische Heilkunst bedeuten wird. Photos and videos from the seminar with Jan Scholten on Wonderful Plants in January 2015 in Germany can be seen here. It gives me great pleasure to write the foreword to this book. Initially when Sandra Petri approached me with her manuscript I felt that this would be a useful addition to the books on sensation since it gives a visual impression of the sensation of the various plant families. As they say ‘One picture is worth a thousand words’. I felt that Sandra Petri’s visual representations to be aligned to my experience of the families. I also liked the idea of the whole book being sort of informal or more at an artistic level rather than something very structured or formal. I believe this also is in the spirit of the plant kingdom. We therefore felt that it is best to preserve the originality of the work including the handwriting rather than use formal typesetting. This book is offered to the students and practitioners of homoeopathy with the trust that it will further help in getting not only the words of each family but an actual live experience by a look at the illustrations. The best way of using the book would be to not only look at the pictures or the drawings but to put oneself in that position and observe one’s experience of it. This edition of SPECTRUM on the homeopathic treatment of trauma is at the same time a materia medica of the Asteraceae. No other remedy family is so closely associated by homeopaths with the theme of injury. Internal and external injuries can have lifelong traumatic effects: SPECTRUM provides answers to the question of how to come to terms with such experiences and integrate them. Our renowned authors have explored the action spectrum of the Asteraceae, presenting both some familiar remedies and some new ones from the big family commonly known as the asters, daisies or sunflowers. Willi Neuhold offers a clear structural framework for the Asteraceae: with the inner experience of the Asteraceae according to the sensation method and its miasmatic classification according to Sankaran, he provides a practical grid for the precise mapping of the individual remedies. A number of homeopaths – including Annegret Gärtner, Sigrid Lindemann, and the pediatrician Andreas Richter – indicate some alternatives to the Asteraceae, such as the Solanaceae. In Andreas Richter's article on the remedy picture and stress cycle of Bellis perennis, we also learn something about modern trauma treatment and the problem of retraumatization. Jürgen Weiland's article about a deeply disturbed youngster from his pediatric practice shows how important and healing this can be, including when working with parents. Jan Scholten's new methodology is also highlighted in this edition of SPECTRUM. He explains in detail how to find the remedy according to his new periodic table of plants so that even those who are not fully up-to-speed with his latest ideas in “Wonderful Plants” can still follow his logic. Clarification of Scholten's thinking is offered by both Resie Moonen and Martin Jakob, who analyze their cases in accordance with Scholten's new approach. With his customary shrewd wit, Franz Swoboda shows how to “crack” Scholten's plant code for uncommon remedies. An original graphic from Jan Scholten's new book is provided, showing the taxonomic overview of the plant world. Renate Paschmanns and Guy Payen present case histories showing the deep soul of the well-known remedy Arnica, which is also capable of healing profound layers of trauma. Declan Hammond's painfully acquired empathy enables him to accept patients who have experienced the worse thing that can happen to a parent – the death of their child. His description of what he went through and the loving way in which he deals with patients in the same predicament is very moving. The astonishing thing, however, is that all these cases have a good ending. Ulrich Welte's fruitful and entertaining overview of the genus Cichorium also repeatedly poses the question “to be or not to be”, which surprisingly, often results in a happy ending thanks to homeopathy, despite the pain experienced along the way in each individual case. Spectrum of Homeopathy: Problem Children? Children cause problems when they don't meet expectations – in terms of their genes, their development and their behaviour. The topic “Problem Children?” of the spring 2015 edition of SPECTRUM is therefore ambivalent, hence the question mark. After all, the problem often lies with the excessive expectations of parents, teachers and a society with innovative information technologies that can overburden even the most developmentally normal children. ADHD and DMDD are diagnoses that may be associated with exaggerated expectations as much as with the sensory overload found in the modern world. With the choice of the cheeky girl for the cover picture of “Problem Children?” we were playing up the amusing nature of the photo: things aren't so bad after all! But that was before the latest fashionable diagnoses from the American Psychiatric Association (APA): “disruptive mood dysregulation Disorder” (DMDD) as well as severe and recurrent verbal and/or behavioral fits of rage. With her case of a highly gifted and extremely angry Lanthanide girl, Resie Moonen raises the issue of whether such diagnoses can be justified. Further contributions from Paresh Varsani, Dinesh Chauhan, Wyka Feige and others show how frequently parents these days seek homeopathic help for their children due to fits of anger and aggression. Treatment is always individualized and the remedies come from all the natural kingdoms. Michal Yakir uses her plant table, for example, to find the most suitable remedy for a girl who is constantly irritable. Alongside behavioral problems, school performance is also a major issue. The paediatrician Heiner Frei presents cases of “academic failure” due to a wide range of causes including learning disorders, poor concentration, lack of motivation, anxiety and hyperactivity. Physical and mental development disorders have always been of concern to paediatricians. Bettina Baltacis reports in a competent and affectionate style on her work in the multidisciplinary team of the first Austrian Down's syndrome clinic. Sunil Anand describes the possible influence of multiple vaccinations on childhood development and the value of vaccine nosodes. Friedrich P. Graf describes the particular dangers of aluminium as a vaccine adjuvant. Andreas Richter examines the common and often highly fraught relationship between adoptive parents and their children. Without intervention and treatment, bonding disorders can often lead to traumatic family dramas. The extract from this issue of SPECTRUM comes from Anna Koller-Wilmkings with her fascinating account of her paediatric practice, presenting the entire spectrum of the theme of this issue – from developmental and behavioural disorders through psychiatric problems to severe physical pathologies, from well-known to minor remedies, and from classical repertorisation to the sensation method. All the authors of this issue of SPECTRUM demonstrate the beneficial effects of homeopathic help for children, not just for classical disorders but also for the pathological excesses of our modern world.